Because wood constantly interacts with moisture in its environment, it can lead to questions about measuring wood moisture content (MC) at different stages of the wood’s life cycle. What happens at the lumber mill? How stable is kiln-dried lumber? What about during manufacturing? What about my wood floor or furniture? Finished wood shouldn’t need moisture measurement, right? Wood is made up of long cells that have a hollow interior and cell walls made up of cellulose, lignin and other organic and inorganic components. (This is an extremely simplified explanation but sufficient for understanding basic wood cell structure.) In a living tree, those cells serve to transport water and nutrients to all of its parts. Once a tree is felled, those cells begin to lose that internal moisture because there is no longer a source to replace it. This is (again, simplified) the basic mechanism of the drying process of wood. What is important to note is that those cells still retain their basic structure: a cell wall with a capacity to transport and store moisture. Wood is a hygroscopic material that is in constant interaction with the moisture in its environment. Those cells that have given up their MC still are able to hold moisture, and will take it from the surrounding air’s humidity, from ground sources, or from direct moisture content like rain, snow, etc. 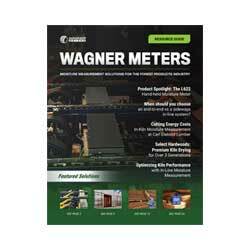 Here at Wagner Meters, we know that wood is in a constant state of giving and taking. It also means some precautions must be taken at each stage of the wood’s use and we’re there every step of the way. 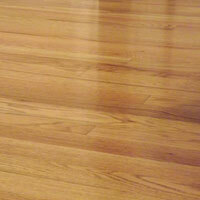 When the moisture levels are still very high, the wood is often referred to as “green” or “wet” wood. This lumber is susceptible to warping, cracking, splitting or buckling depending on the rate of the drying process as the moisture leaves the wood. Obviously, this can cause problems if this wood is used for building or other products while it is still “green” when put into use. Even as firewood, the high level of moisture in fresh cut wood can cause problems. For those in the building, flooring or woodworking specialties, it can be a very costly problem. 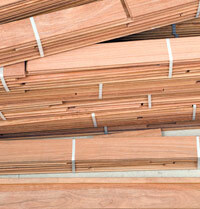 Lumber mills are the first to dry lumber in the chain from forest to finished wood product. Their goal is to bring the wood’s MC down to levels that will minimize the possible problems of high moisture levels in the wood. They do this either through the air-drying processes or by using large kiln ovens that use a combination of heat and ventilation. Moisture measurement is crucial to a lumber mill’s business because the accuracy of their systems can improve the grade, optimize energy usage, and increase their bottom lines by producing quality-grade lumber and wood stock for their customers. Using high-end moisture measurement systems, like the end-to-end (Longitudinal) or sideways (Transverse) moisture measurement systems from our Forest Products Division, mills can closely monitor their lumber’s moisture condition. Once cut, dried, graded and ready to distribute, lumber that is being shipped must still be protected during transportation and storage. Mills will generally use either dunnage or wrapping (or both) to prevent moisture problems in lumber shipments. Dunnage is an inexpensive material used to keep cargo from shifting or to protect it during transportation. For lumber, it will often be inferior-grade wood put on the ground to elevate loads (above possible ground moisture), or to strap it during transportation. Wrapping uses a layered material (usually a paper or fabric layer with a waterproof material layer) to wrap the dried lumber or wood. Its purpose is two-fold: to prevent moisture from contacting the wood and to absorb any small amounts of excess moisture that may be present. 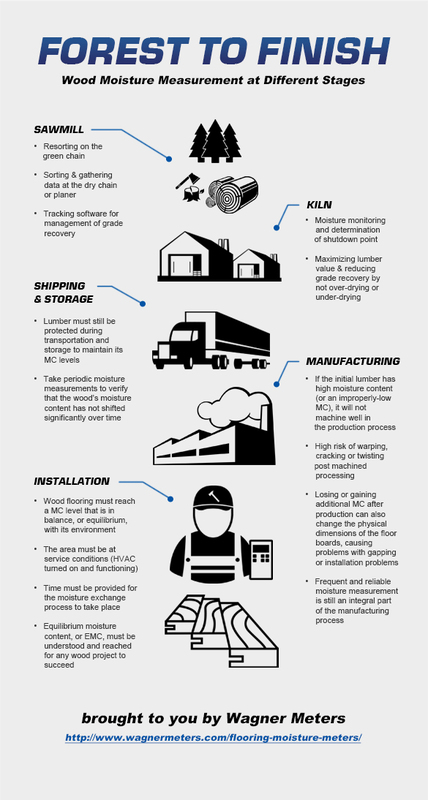 Whatever the method, protecting wood during transportation and storage is a key element in maintaining its MC levels. It’s also advisable to take periodic moisture measurements to verify that the wood’s MC has not shifted significantly over time. Hand-held wood moisture meters are available for quick scans of lumber or wood stock, or are also available in a format that functions with a stack probe for load checks. Wood that is going to be manufactured into a specific product must also be carefully monitored for MC. Let’s use wood flooring as an example. 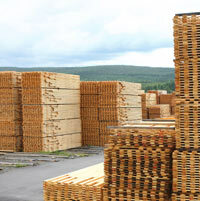 Kiln-dried wood is delivered to the flooring manufacturer where it begins the process of being cut, trimmed, grooved, sanded, graded and sorted. If the initial lumber has high MC (or an improperly low MC), it will not machine well in the production process, and runs a higher risk of warping, cracking or twisting after it has been machined, or worse, after it has been delivered to the customer. Losing or gaining additional MC after production can also change the physical dimensions of the floor boards, causing problems with gapping or installation problems. Frequent and reliable moisture measurement is still an integral part of the manufacturing process. For engineered wood flooring (or other engineered wood products) the stakes go up. Most engineered wood flooring production involves connecting several layers of wood or wood fibers, usually different species, bonded with an adhesive. High MC can have the same risk for each layer of wood, but can also present the additional problem of causing adhesive failure. If one layer breaks down, the floorboard is spoiled. Add a pre-finishing process, and the risk of finish problems can also be added if MC is not carefully monitored. When successfully manufactured, bundles of wood flooring, like the lumber they began as, are also typically wrapped in plastic and stored in climate-controlled facilities to protect them from moisture intrusion during storage and transportation to the customer. Once successfully delivered to the job site, the wood-moisture dance is not finished yet. This is most likely where you will step into the moisture measurement process. Because each warehouse, each lumberyard, and each room are unique in terms of its temperature and humidity levels, it is never safe to assume that the wood will be in balance with a new location or job site. In fact, this may be the most critical part of the entire process when it comes to preventing potential moisture-related problems, and it’s in your hands. Wood must be allowed to reach a balance with its environment in order to function at its best. To go back to our wood flooring example, flooring must have time to reach an MC level that is in balance, or equilibrium, with its environment. The area must be at service conditions (HVAC turned on and functioning) and time must be provided for the moisture exchange process to take place. Equilibrium moisture content, or EMC, must be understood and reached for any wood project to succeed. How do you know if your wood has reached EMC? Our damage-free wood moisture meters provide a quick, easy-to-operate, accurate assessment of wood’s internal MC with pocket-sized convenience. They can measure a wide range of wood species. In addition, our damage-free technology means you can recheck the wood as often as necessary without damaging the wood surface. Only when the wood’s MC has stabilized can the flooring be installed and finished with confidence. So, once the finish is applied, it’s time to relax, right? Properly applied, wood finishes do provide a measure of protection against this constant give and take relationship wood has with moisture. They do this by sealing the wood cells and making it more difficult for moisture to penetrate the wood. However, even after the wood has been finished, it is a good idea to perform maintenance checks on wood flooring to be sure that moisture has not accessed the wood from an unplanned source like a leaking appliance or a subfloor source. Finishes also wear down over time and the level of protection they offer will erode too, so follow the manufacturer’s guidelines for maintenance and reapplication. From start to finish, wood moisture measurement plays a key role at each stage in the wood’s journey from forest to finished floor. Our wood moisture meters provide the best guarantee for the long-lasting beauty of wood. Learn more at www.wagnermeters.com/woodworking.php. (1)Sita Warren, Doug Siebel, and Jeff Robinson, Packing Kiln Dried Lumber for the Customer, http://ir.library.oregonstate.edu/xmlui/bitstream/handle/1957/5018/Packaging_Kiln_ocr.pdf?sequence=1 (May 1997). Larry Loffer is a senior technician at Wagner Meters, where he has over 30 years of experience in wood moisture measurement. With a degree in Computer Systems, Larry is involved in both hardware and software development of wood moisture measurement solutions. What Is Specific Gravity in Wood? My installer left some cracks in bathroom floor, How can I clean between the cracks? I was a new home owner and didn’t notice after he left what happened? Hi Karen — We would suggest that you contact the original or a new installer to get it fixed if it wasn’t done correctly. Unfortunately, we don’t have any cleaning tips to offer as we specialize in measuring moisture. You may want to do some additional online research specifically for cleaning these gaps too.